This is a car game like no other as you wont be driving them but more so, you will need to make the black vans fall off the ledges. 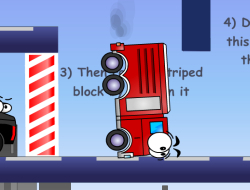 Also you should know that each car you can maneuver has a special power. Do your best to use them at your advantage and make the vans regret every starting this rebellion. There will be signs that turn your car around and you should think ahead of your moves so you dont end up pushing the good cars off the map. Use the mouse to start and stop the cars. Vehicles 0.00 between 0 and 10 based on 0 votes.